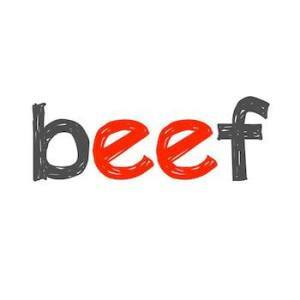 BEEF, as the program points out, could mean the meat of a cow, prepared for cooking or an argument or disagreement. In this performance, burgers are consumed and arguments are aired, as the narrative skips back and forth in time to reveal the relationship timeline of two not-especially-likable characters and their respective quirky pals. As the show carries on, three of the four characters address the audience directly — all but the white straight-boy protagonist, whose motives apparently require no explication? — and give us some insight into how they feel about themselves and their accomplishments. Once we found The Box theatre, which was well signed (and needed to be) and surveyed the amusing and well-stocked snack assortment that included mini-marshmallow burgers, we settled in for the 70 minute show. It was performed in a refreshingly empty room with only a single item hung on the wall (and changed at intervals) to distinguish between scenes. I appreciated the choice to make a virtue of the inevitable (a converted industrial space with no wings or backstage area) and just… gesture at place. The show opens at a burger joint, where our primary romantic couple are in the process of breaking up because Kali (Supinder Wraich) does not share her boyfriend Max (Michael Musi)’s enthusiasm for the burger joint to which he has just, with great ceremony, conducted her. Or because she’s shallow. Or because he’s damaged. Or because he’s shallow and she’s damaged. The scenes that follow suggest variety of reasons for the breakup that leads the action. As a structure, I really enjoyed the opportunity to consider and reconsider what I already knew based on each piece of new information. Unfortunately, it was a little “beautiful house, awful furnishings” for me — I really did not like most of the characters. The actors were fine to good, and certainly they did their best, but of the four characters, three of them were fairly unlikable. Only artist Sam, played by Madison Walsh, seemed at all sympathetic (the last is Robby, played by Ronnie Rowe). Everyone else just made me tired and, eventually, cross. Which unfortunately isn’t great — loathing a character is one thing, finding them all annoying and self-centered is really really difficult to pull off. This show didn’t quite manage. Not liking most of the characters in a play is a difficult spot for me, as a reviewer. It then becomes a struggle to watch and try to identify other things about a piece that are, indeed, going well. These actors are excellent at being annoying and self-centered! Rarely have I felt so glad to be queer as I was after considering for 70 minutes a dating pool containing these humans – which, since the show is about dating, seemed an appropriate reaction. It may also be that this Sideways-style narrative is also not my very favorite – as a reviewer, I do enjoy a little more plot and a little less complaint, though I understand that it’s a popular idiom right now. Overall, my take on BEEF turned out to be: some parts well-done, but mostly not my special sauce. BEEF played at The Box, from October 21 to November 2, but technical difficulties prevented the review from appearing on time. We regret the lateness of this review.